In the spirit of Spring cleaning, I have rearranged my stock (to make room for more), sorted out my stash (gently depriving myself of some) and very gingerly approached my WIPs. I am totally convinced that everyone’s WIP pile is a very telling story of their personality and life. I have taken a long hard look at mine and can’t for the life of me work out what my WIPs say about me. So I thought I’d throw open the closet and with a few helpful pictures seek your help. I had a very large stash of beautiful blue (yes, it IS blue, I know the pictures are not very good) bulky yarn that just didn’t want to knit into anything useful. I came across the idea of crocheting mats for the home and with the help of a little extra investment (!) 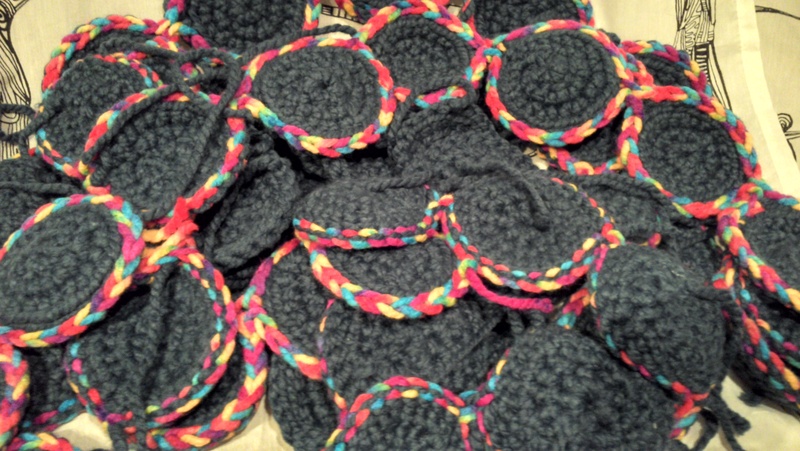 in contrasting bulky yarn, these little circles started to grow and be joined. I have come to a total standstill and haven’t touched them for about six months. My guilt is high with this one as I promised them for my “baby” son, who excels at tugging at the heart-strings. I know that some time soon I must finish this project as it is useful, I can’t frog the work as I’ve cut the yarn into small sections to make the circles and in its current state this is taking up an inordinate amount of space. Maybe a summer holiday project…. I love this pattern. I adore the texture BUT the pattern sends me loopy with boredom. I just can’t ever face picking this up ever again. 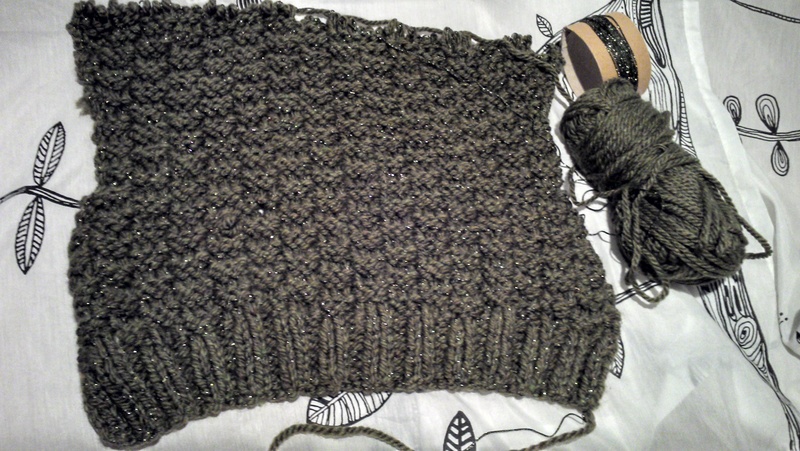 It is such a shame as the yarn is perfect for it – body with good drape, subtle change of colour tone and beautiful sheen. What a waste. I have a favourite jumper that isn’t hand-knitted by anyone I know. It’s from a large Spanish fashion chain store (no names) and I have loved it to stretched and bobbly bits. It is made holding a chunky woolly yarn with a wonderful girlie sparkly one. It has a basket weave pattern all over with a very large cable running up the middle of the front. Fake polo neck and very fitted. That’s it. A while back during a rather quiet (read boring) Easter break away from home, I popped into the local yarn store and bought some bottom end durable yarn in a beautiful olive green with a lovely green sparkly one and cast on. The work you see is what I produced that night. Since I knitted “blind” i.e. whilst watching TV with the boys, I dropped a stitch and that threw the basket weave pattern. At that stage I thought I just miscounted and soldered on. Now of course I can see the mistake and not only does it bug me, I just don’t have the heart to undo it and start again. So it’s just sitting there making me feel bad. I do have to admit that this is not all but I just refuse to count experimental work for new patterns, impulsive attempts at something new, inappropriate use of yarn which I have now all frogged. I also have to admit that I hide my WIPs in one large basket which is very decorative and I don’t like opening it too much. Like a Knitter’s Pandora’s box. Now that must say something about me! What are your WIPs shameful or not? I would love to hear from you and see pictures. It is very therapeutic to “come clean” with WIPs in closets. This entry was posted in colour, Craft, Fashion, Interior Design, Knitting, Patterns, wool, Yarn and tagged knitting, pattern, psychology, WIP, yarn. Bookmark the permalink. Luckily for me (I think), all my WIPs are in my head with maybe some designs drawn on paper. Makes it easy to hide any evidence! 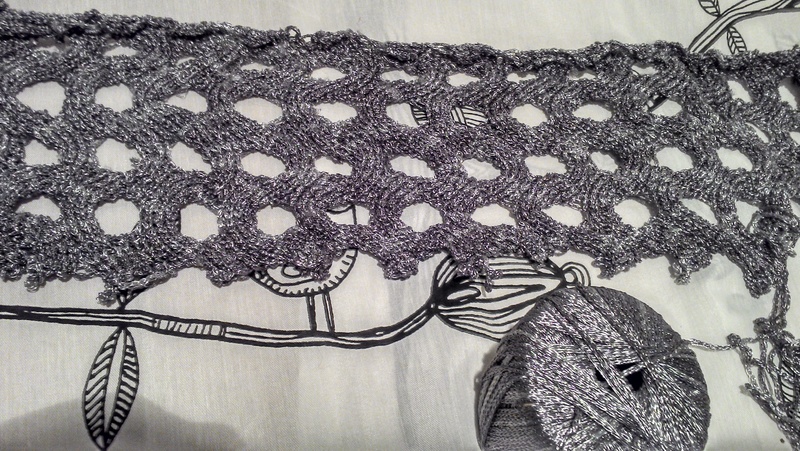 That’s the next step in my knitting odyssey – learning to draw designs! I’m really looking forward to having a little time to start, I’ve seen some great textures I’d like to replicate. As ever, too much to do and not enough time. I have a few of my own WIP’s! I have being think about it and decided that some of us like/enjoy the journey/process not necessary the finish product! There’s been a blog recently as to what makes knitters tick – the project or the outcome. I need to finish things as otherwise I feel bad. However that doesn’t mean I like the finished product! It’s very rare for me to have more than one knitting project on the go (evidence of my slight tendency to be a control freak? ), but I think all knitters have a long abandoned, guilt inducing WIP lurking somewhere that just cannot be picked up again. Mine is a pink laceweight, tunic length sweater, knit in stockinette – what was I thinking?